(Seated at the table) Robert Gagné, Director of Research and Knowledge Transfer, HEC Montréal, and Johanne Gélinas, along with Pierre Olivier Pineau (standing in back on the left) and Minister Pierre Moreau. Quebeckers are using more and more energy, in particular gasoline and diesel fuel, cancelling out the energy efficiency gains they have made elsewhere. This is one of the findings of the 4th edition of État de l’énergie au Québec, an annual overview published by the HEC Montréal Chair in Energy Sector Management, summarizing the latest energy sector data. The report notes that it will be impossible to meet the government’s targets to cut petroleum product consumption by 40% and greenhouse gas emissions by 37.5% by 2030 if current trends continue. The authors say that more efforts must be made to change our transportation habits and develop alternatives to solo driving. État de l’énergie au Québec 2018 was launched in Montréal on December 13, at the head office of BMO Bank of Montreal. BMO Capital Markets was the main partner for the event. The Minister of Energy and Natural Resources and Minister responsible for the Plan Nord, Pierre Moreau, and the President and CEO of Transition énergétique Québec (TEQ), Johanne Gélinas, were on hand for the occasion. 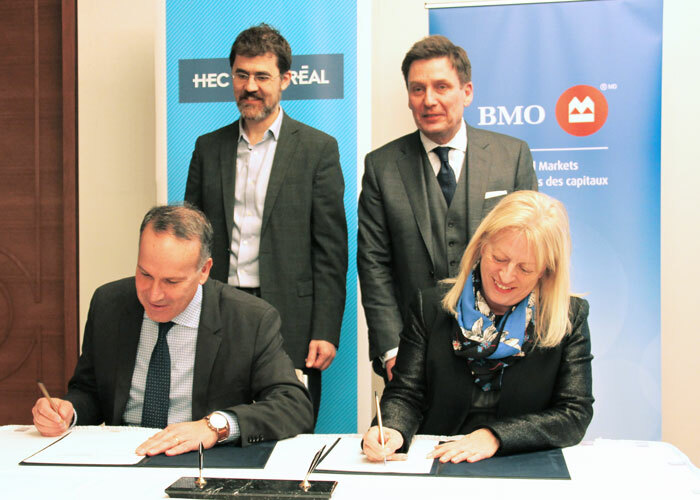 The Minister took the opportunity to announce that Transition énergétique Québec will be donating $1 million over 5 years to the HEC Montréal Chair in Energy Sector Management to contribute to its research work. This funding is in addition to the financial support from 10 other Chair partners: BMO, Boralex, Brookfield Renewable, Enbridge, ENERCON, Énergir, MERN, McCarthy Tétrault, PwC and Valero.